Lethal Cecil Pettigrew, Boxing Trainer, Cecil Pettigrew Foundation, Tulsa Personal Trainer, Forge. Tulsa’s first ever Tough Man (1980), former Northeastern State University wrestler and Southwest Missouri State running back, Cecil Pettigrew has been a Brookside staple and beloved boxing coach since 1996. 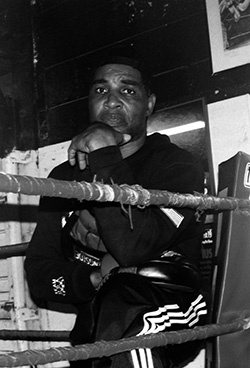 ‘Lethal Cecil’ finished his professional boxing career in 1998 ranked 5th in the North American Boxing Federation with a record of 52, 12, 3. For 21 years, Cecil has had a wait list of clients who willingly and gratefully subject themselves to verbal assaults and physical punishments inside his ring. Cecil believes that an individual’s greatest investment is in their physical capital, and a community’s greatest investment is in its children. Through the nonprofit Cecil Pettigrew Foundation, Cecil and his wife Carrie have mentored hundreds of kids in the Tulsa area, many who likely made the brave decision to break free from a future behind bars to be surrounded by his love, his training and his discipline.